Robert and Eleanor Romadka are committed, first of all, to one another – they have been married for 65 years. And they are deeply committed to Catholic education and their community. 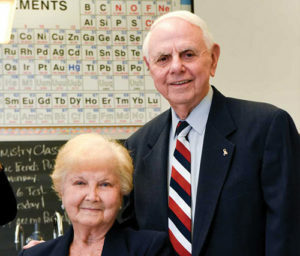 They have been leading donors to The Catholic High School of Baltimore, Mrs. Romadka’s alma mater – in 2001, for instance, funding the renovation of the school library – and for five decades, have done their part to support Our Lady of Mt. Carmel School. In the 1960’s, Robert became a member of the school’s advisory board, a role he still maintains today, and in the early 1970’s, he and Mrs. Romadka donated funds to establish a media center and library at the school. Lawrence Callahan, President of Our Lady of Mt. Carmel School, cites the many ways in which the Romadkas have helped. “They have done everything,” he said, “from financing fundraising events to contributing to the purchase of smart boards for our classrooms.” Perhaps more importantly, the Romadkas have done a great deal to support tuition assistance grants for families who wish to send their children to the school.